The Yowza Fitness Delray Elite treadmill was the top model in the Delray line of machines from Yowza Fitness. The Delray Elite came with a strong warranty for lifetime motor and frame,5 years on parts, and 2 years on labor. Yowza Fitness products are built by a company called GreenMaster that is headquartered in Taiwan. This manufacturer has been building fitness machines for over 25 years. This company isn’t what it used to be, so we now recommend other brands like Sole, NordicTrack, or ProForm instead of Yowza machines. NOTE: This machine has been discontinued. Instead, we recommend you check out the new NordicTrack Commercial 1750. 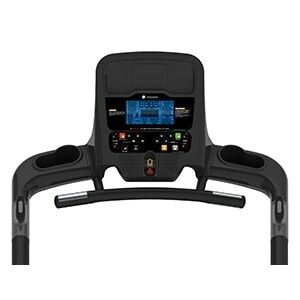 Deck and Shock Absorption Design — The Yowza Fitness Delray Elite treadmill uses Yowza’s patented Swing Arm Suspension for shock absorption. Much like the suspension on your car, this unique design has an arm bar at the front of the machine that allows the entire deck to give with the impact of your step. As your foot travels back on the deck, you will experience a firm surface from which to push off. The Swing Arm Suspension acts to protect your knees, hips, and back from excessive strain during running. We would characterize this type of suspension as a bit stiffer than some of the options from the competition. Rather than a squishy surface, the entire deck is moving with your steps. Ultimately, it is a matter of personal preference and there are many folks out there that love this type of suspension. The suspension will also vary with your weight as lighter individuals may notice a slightly firm surface while heavier folks more absorption. Motion Control – Our absolute favorite feature on the Yowza treadmills has to be their motion control system. If you’ve ever been frustrated by punching numbers mid-workout to adjust your speed, then this is what you’ve been looking for. When the Motion Control setting is activated you can speed up your machine by waving your hand over a sensor on the right handrail. Wave your left hand over another sensor to slow down and wave both hands to stop the machine. This is the best method to quickly control machine speed that we’ve ever seen. The standard quick speed buttons are also present if you prefer. 3.5 Continuous Duty HP Motor — This is a great motor that will easily handle the abuse of running for multiple users. Yowza motors are known for being industrial strength and quiet. Best of all, the motor comes with a lifetime warranty. 20? x 63? TreadBelt — This is a nice long deck that will work well for runners and taller individuals. Mediaport – Hook up your MP3 device directly to the machine with a connection cable. It is located away from the main display so your stats won’t be blocked by your device. Workout Programs —Enjoy 15 workout programs and save to seven different user profiles on the Delray Elite treadmill. The machine includes a 5K LEARN program and a Heart Rate Control Program that automatically adjusts speed and include to maintain an optimal heart rate. Heart Rate Control — Speaking of heart rate, this machine comes with a wireless heart rate chest strap. These straps do a better job of reading your heart rate than the standard grips. If you prefer the grips, they are on the machine as well. Console Design and Features — The console on the Delray Elite is easy to navigate and sturdy. There are two water bottle holders with room for some extra items. We will note that the water bottle holders will probably only accommodate narrow bottles. This machine goes up to 12 mph in speed and has 12 levels of incline. Warranty – Lifetime on motor and frame, 5 years on parts and electronics, 2 years on labor. It is obvious that Yowza Fitness has confidence in the quality of their products. Overall, the entire Delray line had some nice options for people who want solid running machines. On the Delray Elite model, we especially liked the Motion Control feature and long deck length. This would be a great option for a taller individual who wants to run. NOTE: This particular machine has been discontinued. 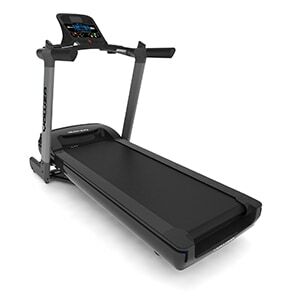 Instead, we recommend you check out the new NordicTrack Commercial 1750.